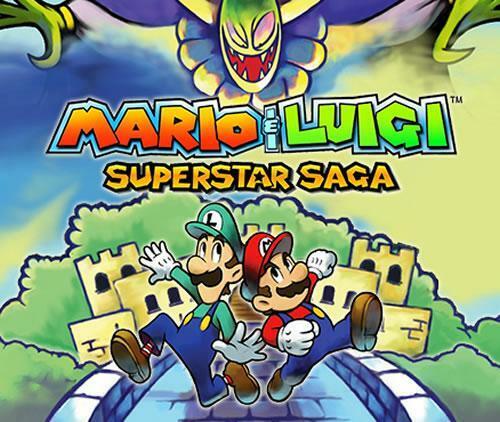 Mario and Luigi: Superstar Saga was released on the Game Boy Advance in 2003 and then on the Wii U VC in 2014. This game started the Mario and Luigi Series, and served as a basis for the rest of the wonderful games that were to follow. In this game, you go through the Beanbean Kingdom and try to hunt down villains Cackletta and Fawful so that they can save Princess Peach’s voice. This game is most notable for being another entry as an RPG. The game starts with envoys being received from the Beanbean Kingdom by Princess Peach. 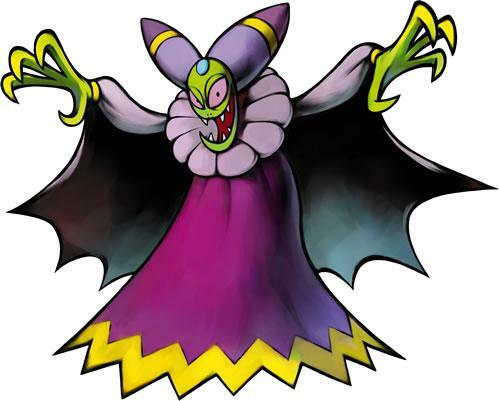 It is quickly revealed that these two people are actually Cackletta and Fawful, and they steal the Princess’ voice and flee. Toad decides to run for help and finds Mario and Luigi so that they can, once again, rescue the princess. After interrupting another kidnapping attempt by the evil Bowser, the brothers use his Koopa Cruiser to help trail the dastardly duo, only to have the vehicle crashed. From this point, the brothers travel around the Beanbean Kingdom in order to help find Bowser and other allies to help them along with their different quests. On the path you see many familiar faces from the Hammer Bros. to Koopas, all of which serve some different degree of help within the context of the story. Towards the end of the game, the Mario Bros. manage to find and defeat the sisters, helping Princess Peach to recover her famed voice. 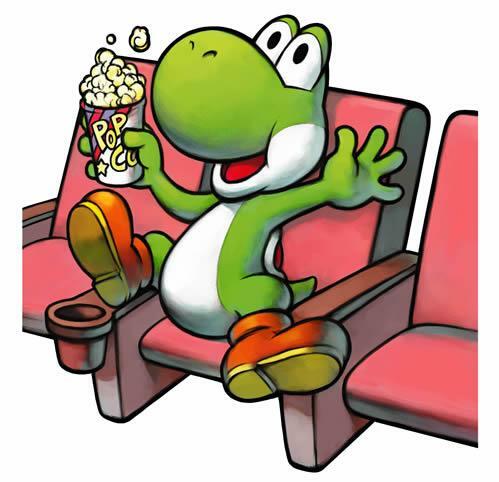 The game ends with the adventure being viewed in Yoshi’s Theater (That is so Meta). Yoshi applauds and everyone ends up celebrating at the Mushroom Kingdom Castle. A Yoshi in the Yoshi Theatre, watching the adventure that turned out to be a movie! The first thing that you should learn about battles in this game is that you can avoid some of them. This means that you do not have to fight each battle, but you miss out on valuable experience when you do. When you do get into a battle, you can attack, run, or use an item. If you decide to run away from the battle once it has started, you will drop some coins in order to make it away. You can avoid this by pressing A or B in a timely manner. 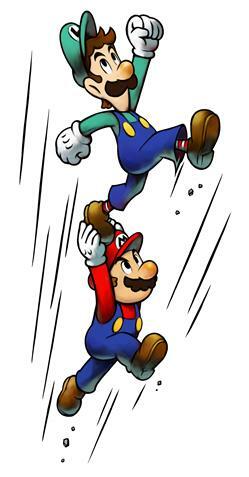 If you have either Mario or Luigi unconscious, then one brother will carry the other away, and then leave fewer coins than others. Items can be used at just about any time in battle, and they have the ability to save your life if you need them to. You can use them to increase your HP and BP, giving you the ability to pull off some very powerful moves. One of the most important aspects of the entire battle system is the variety of attacks that you can manage to pull off. This can be something as simple as a solo attack or even a combination attack. Each character comes along with specialties and partner attacks that they can use. Jump: Mario leaps into the air and lands on an enemy. Hammer: Mario pulls out his hammer and smacks enemies left and right. Hand: Mario uses his firehands to destroy enemies that are in his path. 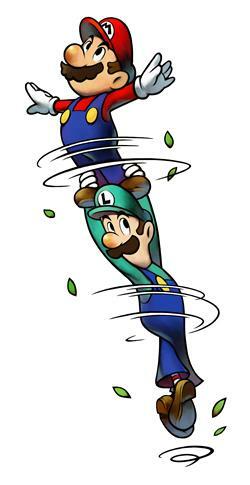 Jump: Luigi does his own jumping move in order to land on an enemy. Hammer: With this one, Luigi uses his hammer to crush enemies in his path. Hand: Using his hands, Luigi electrocutes his enemies to destroy them. The so-called Bros. Attacks are combination efforts by the two brothers as they fight their way across the kingdom. In order to use these attacks, you have to use BP, or brother’s points. Depending on how you choose to execute the attack, you will use more or less BP. You can use the easy mode, which has commands to follow as well as slow motion, medium, with commands but no slow motion, or hard, which has neither benefit in order to successfully pull off the moves or slow motion. These attacks can be very powerful. Mario and Luigi performing Bros. Attacks from the Mario & Luigi: Superstar Saga official artwork. There are a variety of secret side quests that you can engage in to gain special items and to find out more of the story’s lore. The items that are found in these side quests can mean the difference between being prepared and unprepared enough to deal with the final stages of the game. Be sure to explore every crack and crevice so that you can find out everything that you need to beat your enemies into submission. Like we said before, the game is most famous for being part of the franchise that built off of the famous “Super Mario RPG”, and used these traditions to make the battle system that you see within the game. You take turns striking enemies using Mario and Luigi’s special moves. You can time the attacks to do more damage. If you happen to get caught off guard on the main world map, then you will enter battle damaged and unable to move until it is your turn. During these battles, you can use a variety of different moves such as solo attacks and even using a combination attack with the brothers. An adventure so big, you'll need both Bros.! Prepare for an epic journey beyond the borders of the Mushroom Kingdom as Mario™ and Luigi™ team up for a hilarious, action-filled adventure! During a normal day of royal duties, Princess Peach meets with the ambassador of the neighbouring Beanbean Kingdom. However, an act of amnesty turns into an act of theft! The evil Cackletta and her awful assistant, Fawful, disguised themselves for the chance to steal Princess Peach's voice. Before the Mushroom Kingdom can fall under Princess Peach's despair, Mario and Luigi will need to work together as they cross the border to the lands of Beanbean Kingdom. Take a break from the adventure and play a quick game in Mario Bros. mode, featuring an enhanced version of the original NES game. With all this awesome action, you'll have hours of fun! Mushroom Kingdom: This is one of the largest kingdoms in the entire Mario World. Ruled by Princess Peach, Mario and Luigi will transverse this area which is filled with grass and mushrooms. Typically, it is seen as one of the friendliest areas in the Mario world because it is the usual starting land, and the enemies are mostly easy to dispatch. Koopa Cruiser: This is Bowser’s own airship that he uses to travel around the world. While you are on board of this ship, you will travel to the Bean Bean Kingdom. It is damaged in a battle which causes the group, working with Bowser, to crash down in the Stardust Fields. Stardust Fields: This eternally night zone is one of the most unique designs in the Mario world because it is always dark. In the background of this land you can see all different manner of fallen stars and barrels on the purple landscape. Hoohoo Village: In Hoohoo Village, you will be introduced to the Hammer Bros who live in here. You can get transported to the top of the mountain by asking Blablanadon. Most interestingly, there is a unique language that is used here. Beanbean Castle Town: This is one of the biggest towns that you are going to encounter in the game, and you can go into shops and houses while interacting with people in the town. This is definitely one of the locations that you will want to spend some time exploring. Beanbean Castle: This is home to all of the Beanbean royal family. Mario and Luigi have to fix the plumbing under the castle (one of the few times they actually do their jobs on scene) in order to gain the trust of the queen. You will come here often in search of information and valuable items. Chucklehuck Woods: For the most part, the Mario Bros. only have to come here a few times, once in passing and the other to get the Beanstar piece. However, this area has a nice variety of forest art that makes it one of the nicer looking areas of the game. Many of the darker and spookier enemies make their home in this area. Woohoo Hooniversity: Mario and Luigi first make it to the University after it has been taken over by Fawful and Cackletta. You have to set up mirrors in this darkened place to bring a ray of light to open up a door. Here is where you have your first battle encounter with Cackletta, and also home to another Beanstar piece. Beanbean Airport: The BeanBean Airport is one of the neatest areas in the game because it eventually allows travel to occur between the BeanBean Kingdom and that of Mushroom Kingdom. In this area you have to do battle with several plants, using Mario and Luigi in order to finish them off. Teehee Valley: The Teehee Valley is an area in the game that was once an ocean floor. However, this is not a swimming level, as the valley is now a desert. Here you will find many undead enemies that you have to defeat on your way to recover another Beanstar piece. Little Fungitown: In terms of design, Little Fungitown is one of the most memorable that you will come across in the game. The village is based on the top of a very large mushroom, and is home to an embassy as well as many shops and arcades. Guffawha Ruins: At one point during the game, you will have to visit this location with only Luigi. As it turns out, Mario has been afflicted with Bean Fever, and needs to discover the cure for him. While the enemies are sparse, fighting alone can be quite the challenge for Luigi. Oho Oasis: Once you make it out of the BeanBean City, you will find yourself heading into the Oho Oasis. This island is home to mysterious inhabitants called the Oho Jee, and has a tropical design to it. The Oasis is home to two difference palaces which must be explored by Mario and Luigi to recover orbs to continue the story. Oho Ocean: One of the most famous areas in the game is the Oho Ocean. The Oho Ocean is home to a surfing mini game where you can earn many different rewards for your surfing prowess. Oho Ocean Seabed: After your trip to the Oho Oasis, you need to find a way to get back to BeanBean Town. After your boat sinks, you will find yourself walking on the seabed in order to get back to town quickly, and while collecting yet another Beanstar piece. Gwarhar Lagoon: After walking on the sea floor, you will eventually wash up in the Gwarhar Lagoon. This lagoon is home to Hermie III, who has taken one of the Beanstar pieces and must be defeated so that the brothers can continue their journey. You can also learn two powerful abilities in this location. Yoshi Theater: If you have been waiting to see Yoshis in the game, this is your only chance. You need to collect the neon eggs throughout the game in order to have the theater open, but it is well worth it when you get to party and celebrate your victory with the Yoshi group. Joke's End: You can get to this cold area by surfing across the Oho Ocean. The entire area is completely made of snow and ice, making it beautiful, yet difficult. The fact that you have to split up the brothers in order to complete certain puzzles at the same time, makes it one of the greatest challenges that you will face in the entire game. Bowser's Castle: This new and improved castle is being used by Bowletta to launch an assault on Beanbean Kingdom, now being able to fly and spit fire. Mario and Luigi have to traverse this incredibly dangerous area in order to face off with Bowletta. After the battle is settled between Mario, Luigi, and Bowletta, the castle is blown apart and is scattered into the ocean. The above trailer was released in 2014 advertising the games arrival onto the Wii U Virtual console. 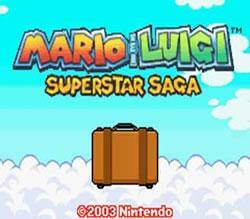 The first time we saw Mario & Luigi: Superstar Saga's gameplay was at E3 2003. This is the trailer. This game garnered some of the highest ratings of any Mario title on the Game Boy Advance. It was hailed as a great victory for going back to the Super Mario RPG style, but with much better graphics and music. These elements were roundly praised by just about everyone. IGN gave a very positive review of Mario & Luigi Superstar Saga, calling it original and innovative and granting it a near perfect score. With a hint of tradition in the RPG turn-base combined with the need to use your button pressing reflexes to get the most out of each attack, there are many different ways that you can enjoy the game. Other reasons that people loved this game included a very well-developed plot and memorable characters. Final Fantasy- Psycho Kamek’s outfit with the white robe and red trim is very similar to that worn by white mages within the Final Fantasy Series. Paper Mario- You will see the hammer, super hammer, and even the ultra hammer make a return in this game. Super Mario RPG: Geno comes back in this game during one of the minigames. The music that plays from Mario’s pad is being played in the Warp Pipe area. Luigi’s Mansion: There are many ghosts from Luigi’s Mansion hanging out in the Starbeans Café. Also, the theme music can be heard when the ghosts arrive in the game. Super Mario Advance- Birdo references her speech in the game if Popple is defeated first, saying “This is as far as you go”. Super Mario Land 2: 6 Golden Coins- The power-up sound from this game is used as the battle opening song. Super Mario 64- The game’s theme can be found in Peach’s Castle. Super Mario Adventure- Much in the same way as the comics, Luigi end up dressing as Peach. Yoshi’s Safari- The Sniper Bills attack the brothers using their Super Scopes. Dr. Mario- Red, Blue, and Yellow viruses are encountered throughout the game, and need to be defeated in the Woohoo University. Super Mario World- The Koopa Clown Car makes a return while being used by Bowletta. You also encounter the Koopalings in the same order in this game. Mario Bros- Enemies such as Fighter Flies and Sidesteppers come back in this game and need to be defeated by the Mario Brothers. Donkey Kong- In a scene that is reminiscent of the original game, Mario has to rescue Luigi by jumping through a stage that has rolling barrels and an enemy that looks very similar to a skeletal version of Donkey Kong. Paper Mario and the Thousand Year Door- In this game Admiral Bobbery wants to have a last Chuckola Cola . Also, Bowser references himself as the Shadow Thief during a scene, which makes a subtle nod to Popple. Mario and Luigi- Partners In Time- Fawful makes an appearance in this game where he trades badges for beans that you collect. 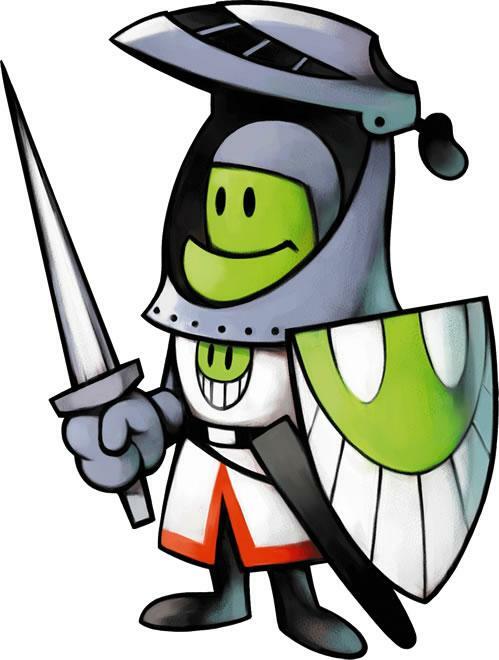 Super Paper Mario- Various Sammer Guys reference Fawful’s lines from the game, saying things such as “My Sword Has Fury”. Super Smash Bros. Brawl: When you hit the random button, there is a small chance that it will appear as FWFUL. Mario and Luigi: Bowser’s Inside Story: Fawful comes back as the main villain in the game. While you are Bowser’s Castle, there are some posters that show Fawful’s appearance from Superstar Saga rather than Bowser’s Inside Story. Mario & Luigi: Dream Team- There are many Beanish characters in the game, where Popple even makes a cameo as a boss character. Cackletta, the main antagonist in Mario & Luigi: Superstar Saga. This guy makes Bowser look nice. Rumble feature comes into effect when used with the Gamecube GBA player. This was the third RPG style Mario game following Super Mario RPG and Paper Mario. After completing the game players cant continue playing, and the game will throw them back to their last save point. Mario & Luigi Superstar Saga is one of the only Game Boy Advance games to have the option to use the rumble when you play it on the Gamecube Game Boy Player. Nintendo Power Magazine featured this game in their Playback issue, citing it as a great addition into the Mario tradition, and one that should be explored more deeply in the future. This is still one of the few titles that cannot be played on the DSi or 3DS, to the chagrin of many people. It is the very first game that can be played on the home console since it was re-released for the Wii U.